← 4th of July Local Food Challenge! This first picture is look at what the whole garden looked like this morning before we did any work on the vines and getting the garden cleaned up. You can see that the Malabar Spinach is growing well, the melons are making a carpet under the trellis, and it’s just a jungle down on the far end where the squash and cucumbers reside. We try to keep from walking in the raised beds on a regular basis, but to really work with these vines, I had to get in under the trellises today! 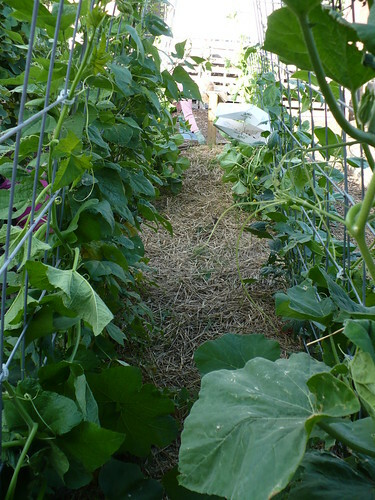 The beans generally do a really good job of growing up the trellises on their own and don’t need much help. The vines on the other hand – they need some help to climb the trellises. The first few vines on each plant did okay at climbing, but as you can see from the picture, that didn’t last long. 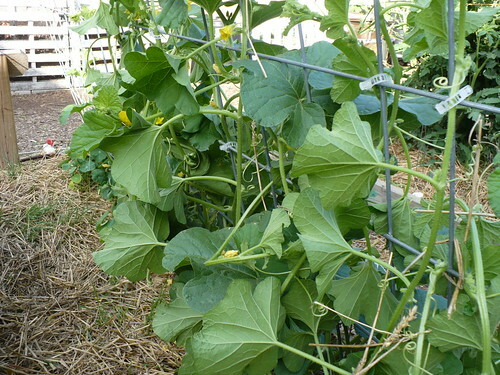 The vine vegetables/fruits do have tendrils that will hold the plants up, but you have to get them up first. So how do we get those vines up on the trellises and keep them there? We are using these clips that you see on the right. These can be found as “tomato clips” or “tomato trellis clips,” and I think they work very well for trellising vine crops. The way the clip on the right is used is how I think is best for clipping on this type of trellis. You try to clip around a spot where the wire cross, and clip the vine to the trellis right under a new leaf branching spot. This secures the vine so that it can’t slide down the trellis. Generally, when you are tying up vines, you want to pick up and try to disentangle an individual vine, and twine it up the trellis in the spot that is most natural. I usually wrap the vine up, in and out of the wires, and then put a clip on one or two crosspieces from the top of the vine. 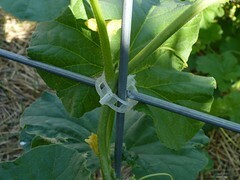 This provides support for the whole vine, without risking damage to the top few inches of the vine. This is the melons after looked like after we got the clips on this morning. You can see the clips are near the ends of the vines, but not right at the ends of the vines. Sometimes you just have to wait and put the clips on a couple days later. Here’s what the garden looks like after getting all of those crazy vines twined and clipped onto our trellis. Much better! Of course, by next Tuesday, there will probably be a lot more vines growing in the middle of the bed, but hopefully we’ll also have a lot of vines growing all the way to the top of the trellis! 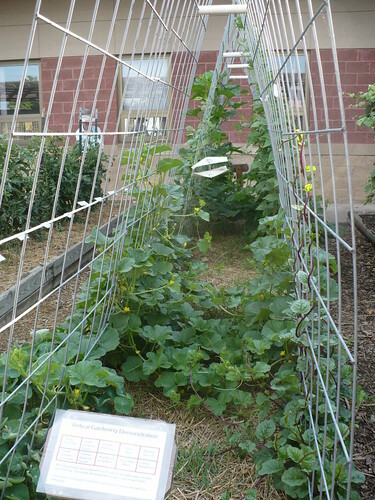 Posted on June 28, 2011, in Working in the Garden and tagged cucumbers, melons, squash, vertical garden, vines. Bookmark the permalink. 5 Comments. are there any plants that grow pretty flowers that you can train to grow vertically? Esther – there are a number of vines that will flower. Hyacinth beans are a nice annual vine that have attractive flowers and purple pods. These aren’t really an edible, but an ornamental. Clematis, passionflower, akebia, trumpet vine, wisteria are all vines that can be trellised. Check out a garden center or a catalog for more ideas! Thanks for the info.. I did some research too and I think I’m going to try a mixture of clematis and black eyed susan vines! I want to plant honey dews an i live close to the georgia florida line and i have aged horse manure can I use that to plant them in it been aged 5 years now im go in to buy the plants from a local farmer but how do I keep the rats and birds from inching on the melon if I get that far.